Такую надежду выразил в интервью The Economic Times Садхуприя дас, ответственный за разрешение вопроса строительства храма Кришны в Москве. По словам популярного индийского информационно издания, визит Нарендры Моди, уже дважды посещавшего Россию в качестве премьер-министра Индии, с момента вступления в должность в 2014 году, может стать потенциальной гарантией того, что храм для Кришны на русской земле все-таки будет построен. Храм Господа Кришны сможет не только удовлетворить духовные и культурные потребности индийской общины, насчитывающей 15 тыс. человек, а также более 25 тыс. индуистов, проживающих в Москве. «Около пяти лет назад нам снова пообещали выделить участок, но до сих пор так и не выделили, — приводит издание слова брахмана. — Мы очень надеемся, что храм будет построен за то время, пока г-н Моди будет находиться в должности». Садхуприя дас. Московских кришнаитов обнадеживает и факт получения в прошлом году Русской Православной Церковью разрешения властей Индии на строительство первого храма в индийской столице Дели. «То, что правительство Индии одобрило строительство православной церкви в Индии, служит прекрасным знаком нашей дружбы. Я уверен, что построенный ИСККОН индуистский храм в России скоро тоже перейдет из разряда фантазий в реальность» Садхуприя дас. It was in the forefront to stall a ban on the Hindu holy book, the Bhagavad Gita, in a Siberian city, but somewhat like the story of Lord Krishna, whose address at birth was said to be a gloomy dungeon in ancient Mathura, the address to Moscow’s only Krishna temple is in a basement in a rented building. And quite like the story of persecution of Lord Krishna’s parents Devaki and Vasudev, the temple run by ISKCON’s Moscow chapter dedicated to the Hindu god, has had to be shifted to the makeshift subterranean abode, due to what is being perceived as sustained non-cooperation by the authorities as well as conservative religious groups, which have in the past, thwarted attempts to construct a temple on land officially allotted to the New York-founded society. But for Sadhu Priya Das, who has been pursuing the issue for ISKCON in Moscow, the arrival of Narendra Modi as the Indian prime minister, who has already visited Russia twice since assuming office in 2014, could well be a catalyst in ensuring that a temple for Krishna comes alive in the land of the Kremlin. “We are very hopeful that in the current tenure of Mr. Modi our temple will be built,” Das told this visiting IANS correspondent. The history of the Hare Krishna movement’s efforts to build the temple appears as chequered as it seems mystifying. The Hare Krishna movement was first legalized in the then Soviet Union 1988, after an initial spell of suspicion in the government establishment about the cult on account of its American lineage as well as unique methods of worship. The real trouble however began in 2004, when its first and only temple located on the Begovaya avenue was demolished by the civic authorities on account of an urban development project. The Society was then awarded an alternative plot of land on the tony Leningradsky Prospekt, a move which saw strong protests from the conservative Russian Orthodox Church and was eventually stalled.An offer of another patch of land in the suburbs of Moscow was also withdrawn by the government just as construction of the temple was about to get under way. “We have gone through a very long procedure for constructing the temple and finally the land was taken back by the government. Almost five years ago, we were promised another piece of land for the temple construction, but so far nothing has happened. The temple is currently located in a rented building in a basement,” Das said. The Krishna temple, according to ISKCON, would not just facilitate the religious needs of the 15,000-strong population of Indians and more than 25,000 ISKCON followers living in the Russian capital but also serve as a social and cultural centre for South Asians in general. 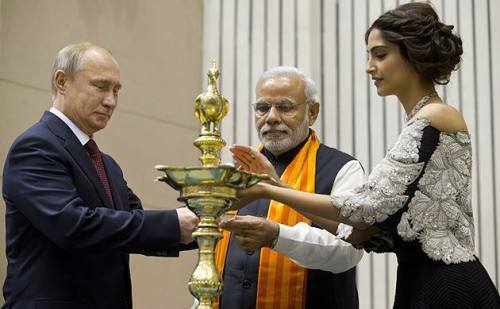 Apart from the Modi-led National Democratic Alliance government being at the helm in India, what has given a fresh lease of hope for ISKCON Moscow followers is the permission granted by the authorities in India to build the country’s first Russian Orthodox Church in the national capital New Delhi last year, following requests by the Russian embassy. Many like Das are perhaps hoping that the Indian government is able to calibrate a diplomatic swap between a church for Christ in Delhi and a temple for Krishna in Moscow. “If the government of India has approved the construction of the (Russian) Orthodox Church in India that is very good sign of our friendship and a good gesture. I am sure that a Hindu temple in Russia by ISKCON will soon be a reality,” Das said.